Sparco EAGLE RS-8.1 Race Suit (FIA homologation). The Eagle RS-8.1 is the result of over 3 years of research and development. Sparco has patented a new technology called HOCOTEX which revolutionizes the way racing suits are made. Made in HOCOTEX is one of the lightest racing suits in the world. It is comparable to the Sparco Superlegerra. Thanks to HOCOTEX, the Eagle RS-8.1 is three times more breathable than a suit produced using traditional technology. The use of this relatively thinner fabric along with large side and back stretch panels and 360 degree arm gussets give the Eagle RS-8.1 ultimate flexibility and comfort. Traditional racing suits have layers of fabric sewn together with a quilted pattern. The quilting provides air space between the layers which bloats in a fire, this provides thermal protection to the driver. HOCOTEX creates a honeycomb structure with internal air cells that ensure the driver even more fire protection. Traditional box quilting creates an average of 300 air chambers in a size 52 suit. Leg length - inside (cm) F.
Leg length - outside (cm). The listing is automatically managed by IdoSell Shop , a system that takes extra care of listing only products that are actually in stock. 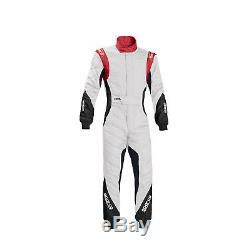 The item "Sparco EAGLE RS-8.1 Race Suit White/Red (FIA homologation) s. 54" is in sale since Thursday, June 28, 2018. This item is in the category "Vehicle Parts & Accessories\Clothing, Helmets & Protection\Car & Kart Racewear\Race Suits". The seller is "rallymerchandise_co_uk" and is located in Dudley. This item can be shipped worldwide.